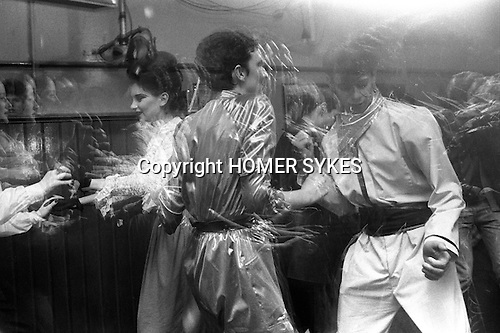 Blitz Kids New Romantics at The Blitz Club Covent Garden, London, England 1980. Julia Fodor (Princess Julia) and a couple of "Space Cadets" dancing the night away. Amelia Lonsdale writes in 2017. The Space Cadet is Dennis Sheldrick, he was in a band called Wonder Stories with fashion designer Keanan Duffty. He worked at the steel works in Scunthorpe, my mum (Yvonne Taylor) worked at Doncaster council. They were into art, my mum studied fashion at college but thats as far as it goes. They made most of their own clothes and would wear them out at places such as The Blitz but also at many more clubs up north. The woman dancing with him in what seems to be a matching outfit is called Denise King. The costume was an overall from his work that he customised, my mum made the cummerbund out of satin, mainly influenced by Bowie's Space Oddity and Kraftwerk. They were invited down to London to Billy's by Steve Strange and Rusty Egan when they were in the band Rich Kids and after that they would go once a month to London for one nighters.